Situated on the right banks of the river Alakananda in the northern province of Uttar Pradesh, Badrinath is couched within the two mountain ranges of Nar and Narayan, with the Neelkanth peak on the background. This breathtaking sight is itself an enchantment for tourists and is called the "Garhwal Queen." It is located in the northern district of Chamoli and the nearest cities are Rishikesh (300 km), Mussourie and Dehradun. Another pilgrim site is the Panch Badri. Yogadhyan Badri, where there is a meditative idol of Lord Vishnu, Bhavishya Badri, where there are forests nearby, Adi Badri, where there are 16 temples and one big temple of Lord Vishnu, are three of the most famous. Joshimath is another religious place. 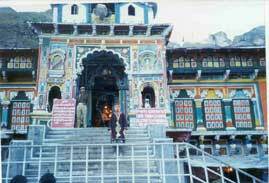 It was established by Adiguru Shankaracharya and named it Jyotirmath, which later came to be known as Joshimath. There are other temples dedicated to Goddess Durga and Lord Narsingha. Gobindghat, situated between Joshimath and Badrinath, is an important place for the trekkers. Another very famous tourist attraction is the Valley of Flowers, with the Pushpavati River and Rataban peak nearby. Lok Pal Hemkund is a beautiful lake in the vicinity of the country's highest Gurdwara, Hemkund Sahib. Mana Village, about 4 km away, is the last village in the Indo-Tibetan border. Other places of interest include Vyas Gufa, dedicated to Sage Ved Vyas; Bhim Pul, the natural bridge over the legendary Saraswati River; the 122-meter-high Vasundhara Falls; Pipalkoti, a place of natural beauty; and Chamoli, a retreat of serene verdure. The nearest airport is that of Jolly Grant, which is about 317 km from Badrinath. Helicopters and small private airlines are allowed to land there. The nearest railheads are Rishikesh (297 km) and Kotdwar (327 km). Badrinath is well connected to all the major tourist spots nearby, namely, Rishikesh, Hardwar, Kotdwar, Dehradun, and other hill retreats of the Garhwal and Kumaon region. Delhi is 238 km from Rishikesh.